Eggplant parmigiana, parmigiana di melanzane, is an old and classic dish of southern Italy. Many of us would be more familiar with its sister dishes, chicken or veal parmigiana. But eggplant is the oldest of the three. be drawn out before cooking. Eggplant parmigiana is a casserole-style dish made from eggplant slices fried in olive oil, or for a lighter version, baked or broiled. Sometimes the slices are dipped in egg and flour before frying, as in bound breading. The slices are then layered with tomato sauce, mozzarella, parmigiano, basil and (traditionally) hard-boiled eggs. 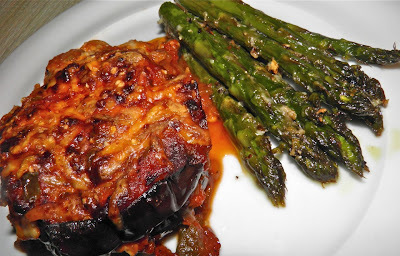 One would assume that the dish originated in northern Italy, around the city of Parma (where parmesan cheese originates) but eggplant first made its appearance in southern Italy through Sicily, so one should safely assume that any Italian dish using eggplant would have began its life there. Riveting or not, it appears that eggplant parmigiana in some form has been around for a very, very long time. I would suggest, though, that it’s more important to make eggplant parmigiana for its nutritional value than because of its ancient origins. Broiled, with a little olive oil and pepper. Many people look at eggplant and its shiny, mysterious, purple surface and wonder whatever one would do with it. It’s actually a very healthful vegetable. The only drawback is that you have to salt it to extract some of the bitter liquid before cooking. That bitter taste is a clue to its health benefits, actually. 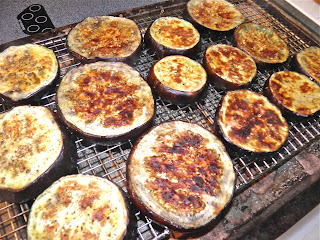 Eggplant is rich in antioxidant phytonutrients. The phenol phytonutrients eggplant contains are among the best to be found in vegetables to scavenge "free radicals" in the body. Those are the damaging molecules that promote cancer development, heart disease and a host of other illnesses. Researchers are also focussing on another phytonutrient in eggplant called nasunin. Nasunin is showing potential benefits for protecting brain cell membranes from damage. Those membranes are what let nutrients in to our cells, and wastes out. Perversely, the higher the levels of these phytonutrients the more bitter the taste of the eggplant. Plant scientists are working on varieties of eggplant that balance the important protective chemicals with better taste. Make sure you choose eggplant with dark, smooth, shiny skin, and use them within a day or two. As eggplants age they become more bitter. Wrinkled eggplants are way past their peak. This recipe uses slices that are then layered. 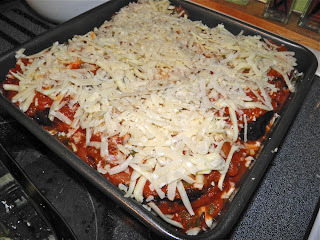 For parmigiana I would look for eggplants that are more evenly shaped than pear shaped. That will make layering this dish – and serving it – far easier. 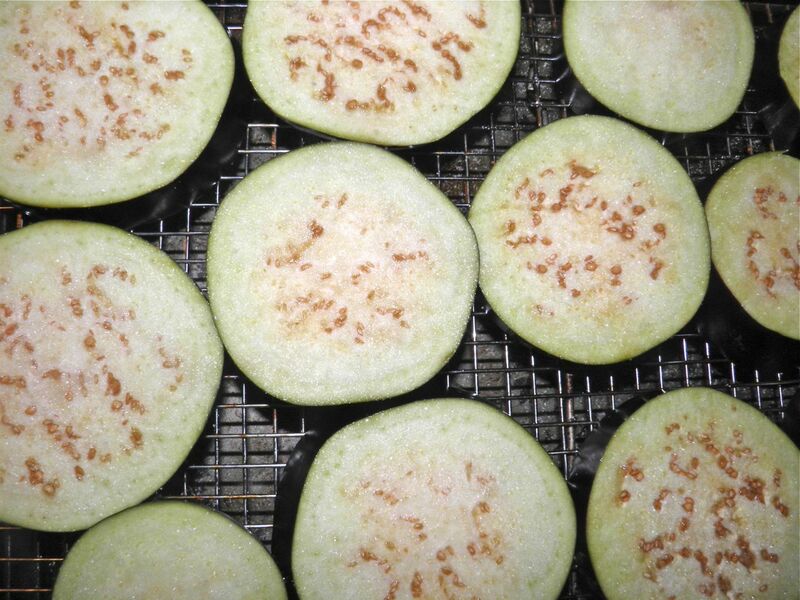 Finding "healthy" eggplant recipes can be a bit of a challenge… Most recipes call for frying. 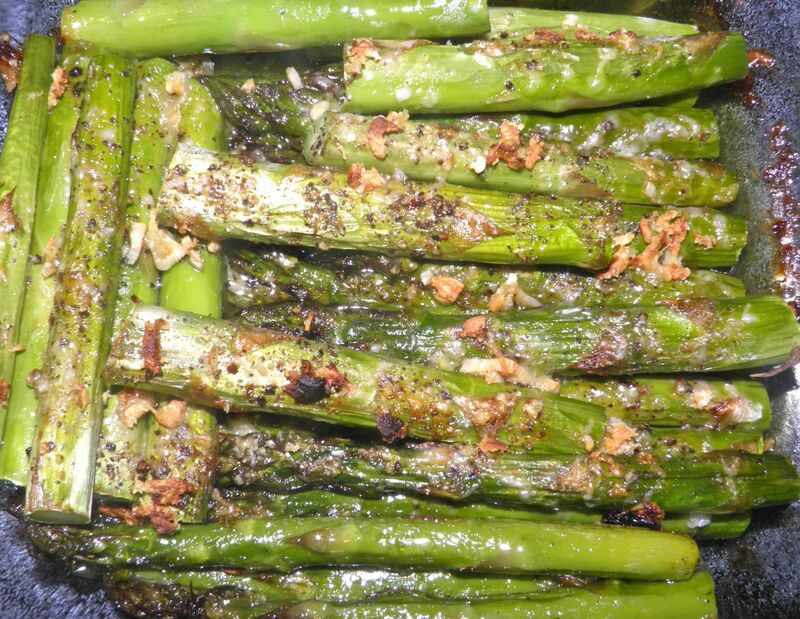 It’s better to find recipes that grill, roast or broil it. Frying with a lot of oil may introduce a higher fat and calorie count that can counter any health benefits present in the eggplant itself. Slice the eggplant into 3/4” thick pieces. You should have enough to make two layers of slices in a 9”x9” baking dish. Salt the slices generously and let weep for about 1/2 hour. Turn and repeat on the other side. eggplant parm for the same length of time. Rinse the slices, pat dry and arrange on a rack over a rimmed pan. Rub the slices with olive oil and sprinkle with pepper. Broil until browned, about 7 minutes. Turn, oil and pepper, and broil the other side. Remove and let cool. Chop the green pepper, onion and garlic and sauté in a little olive oil until sift. Mix with the tomato sauce, basil, oregano and cayenne pepper. Pour 1/3 of the sauce on the bottom of the baking dish. 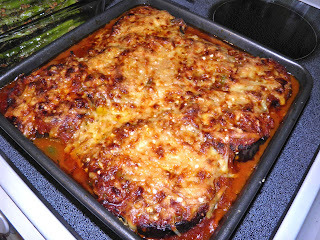 Arrange half the eggplant slices on the sauce. Sprinkle with 1/2 of the bread crumbs and then 1/3 more of the sauce. Then sprinkle on 1/2 of both cheeses. Repeat with eggplant, crumbs, sauce and finally the remaining cheese. Bake in the centre of the oven for 30-45 minutes, until the cheese is browned and bubbly. 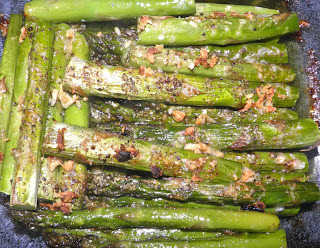 Serve with the "bonus" side dish, shown above right.